What is the Human Relations Administration Major? Students in the Human Relations Administration (HR Admin) major complete course work and field placements in preparation for careers in the growing field of human resources in both for-profit and not-for-profit sectors. The major is designed to provide students with the skills necessary to facilitate critical workplace training and development, manage employee relationships, enhance staff motivation and navigate important legal aspects of workplace administration including diversity and inclusion. The curriculum includes courses in several academic disciplines including business, communications, human development, interpersonal relationships, and mentorship/counseling. This curriculum and a required minor in Organizational and Community Leadership, provides students with a unique blend of courses and skills to make graduates marketable candidates upon entering the workforce. With up to 450-hours of internship experience, students will also have on-the-job training in a human resources organization and a two-credit seminar focused on professional development and professional issues in the field. To learn more about the major, visit the University’s Major Finder. Students are welcome to use the HDFS Advisement Center for support. The center is open every weekday from 10:00 am-3:00 pm, when an academic advisor is always available to help with things like course selection, transfer credit processes, career opportunities, etc. In addition, faculty members are also available to provide advisement support to students. 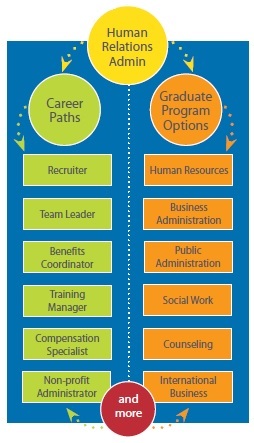 Students in the HR Admin major will also be assigned an advisor for the Organizational and Community Leadership minor.